This is the Piper Cams BP255 cam developed for high torque for urban and long-distance touring. It's origins date back to the mid 1970s from a Ford cross-flow derived profile, instigated as the much-copied HR255. 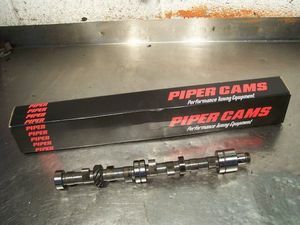 Piper's up-dating of their cam range later in the 1980s in to their 'BP' range saw this profile slightly re-designed to further improve it's performance and longevity. Then called the BP255. It's minimal over-lap at TDC gives it's characteristic very smooth idle and very strong torque from as low as 1500 rpm, but still giving surprisingly good performance right through to 6,000rpm. All without the need for high ratio rocker gear. Not as good in small-bore engines as the 997 Cooper cam 88G229 at low to medium throttle openings. Excellent in large-bore (1275) based engines. To avoid premature wear, I very strongly advise, to the point of insistence, that you use the cam followers sold on this site (CST3024 standard type, CST3025 race type) as they have had the face re-profiled to give them the essential correct shape absent from the vast majority of followers on the market. Now ground on brand new cross-drilled cam blanks. Comes with cam lube and installation instructions.